ASTORIA — Queens businessman Paul Halvatzis isn't afraid to bare it all for the sake of a good cause. Halvatzis, 52, will be shaving off his signature mustache later this month to raise money for an autism services organization he says was instrumental in helping his autistic son, Paulie, grow into the accomplished 21-year-old he is today. "When he was diagnosed, the doctors said he would never learn how to read, write, socialize or function on his own," Halvatzis said. "[But] through a lot of intense teaching, he reads, he writes, he does math, he can speak, he dresses himself, he learned to swim, he can shoot baskets." His son — whose family nickname is "Fun Paulie" — has been involved for over a decade with the nonprofit Quality Services for the Autism Community (QSAC), which runs an array of programs and services for more than 800 autistic individuals in New York City and Long Island. Halvatzis, an active member of the Astoria business community whose family runs Amorelli Realty on 30th Avenue, said he mulled the idea of shaving his mustache last year "just to change," after three decades of sporting facial hair. Then he decided to see if he could capitalize on that decision for the benefit of Quality Services. "We did a mailing to all the people on my Christmas card list and they all started sending money — friends and business acquaintances," said Halvatzis, a QSAC board member. By the time he was ready for the razor last year, he'd raised $25,000 for the organization. Halvatzis grew his mustache back and is ready to do it all again, this time with a goal of raising $35,000. 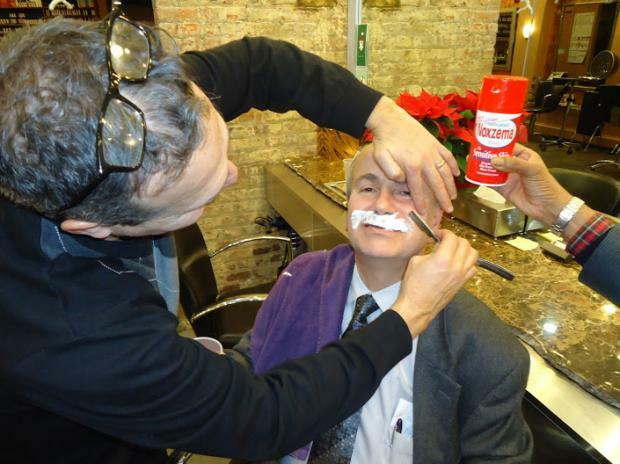 To get there, he's enlisted the help of friend and fellow local business owner Gary Bonelli, who hasn't shaved above his top lip in 37 years. "We should get a lot of money for this mustache," Halvatzis said. Bonelli, 57, who owns Astoria construction company Bonardi Construction, says he and his wife were excited to help — they also have an autistic relative and have supported QSAC in the past. "With everything going on, I thought it would be a good tool to raise some money," Bonelli said. Plus, his family is eager to see him, for once, without his staple 'stache. "My son and my daughter, they’ve been asking me for years," he said. "They haven’t seen me without a mustache — they want to know what I look like." The fundraising will culminate with a wine and cheese party at Astoria's Redken Saloon Salon on Dec. 28, where Halvatzis and Bonelli will get in the barber's chair for a ceremonial lather and shave. Also getting in on the fun this year is Paulie, who let his own facial hair grow for the occasion. "He wants to shave his mustache with his daddy," Halvatzis said.